As part of their SHA-2 migration plan, Microsoft, Google, and Mozilla have announced that they will stop trusting SHA-1 certificates. Google began phasing out trust in SHA-1 certificates in November 2014. November 2014 – SHA-1 SSL Certificates expiring any time in 2017 will show a warning in Chrome. 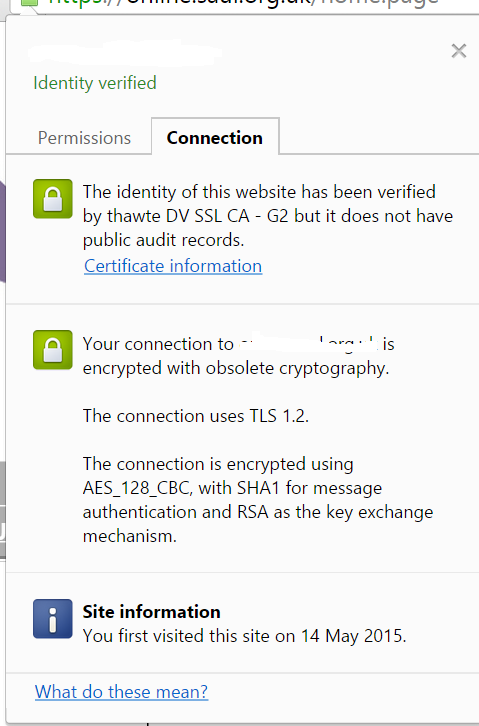 January 2015 – SHA-1 SSL Certificates expiring any time in 2016 will show a warning in Chrome. 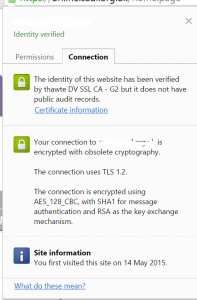 January 1, 2016 – Microsoft will end trust for SHA-1 Code Signing Certificates without time stamps. January 1, 2017 – Microsoft and Mozilla will end trust for all SHA-1 SSL Certificates. At the time of writing, if you wish to generate a SHA-2 CSR for a certificate on an F5 Load Balancer, you will be unable to do it via the web UI but you can use openssl from the bash shell. You can then import the private key via the web interface, and send the CSR to the CA to get your certificate. Many older clients don’t support SHA256, but the real question is which of those are relevant? The answer will vary depending on the site. For detailed information on client capabilities, head to GlobalSign, which maintains a detailed summary of SHA256 support for a large number of platforms. On the desktop, Windows XP introduced SHA256 in Service Pack 3. Users running SP2 should be able to upgrade to SP3. Depending on a site’s profile, a significant chunk of the user base might be running XP. This operating system is still very popular in China and there is also strong anecdotal evidence that it remains widely used in some large organizations. Among the mobile platforms, Android added SHA256 support in version 2.3. Earlier versions—still used in large numbers—support only SHA1.